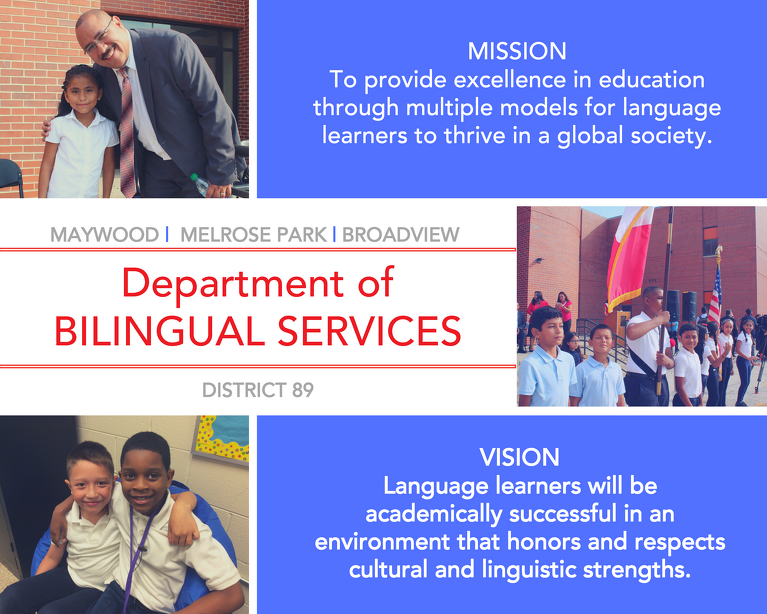 Maywood-Melrose Park-Broadview School District 89 is proud to offer a variety of language support services to meet the needs of our second language learners. These home languages are a great asset to our district. Learn more about our multiple models for language learners in District 89 by reading the following questions. 1. WHO ARE THE ELS? EL stands for English Learners. English Language Learners are students who are learning English as their second language and need assistance in developing the academic language skills required for school. Students need to acquire both the social and academic language. 2. HOW MANY ELL STUDENTS ARE IN DISTRICT 89? English learners make up 25% of our population in District 89. We have approximately 1,300 students identified as ELs in our various program models. The majority of the students come from Spanish-speaking homes. 3. HOW ARE STUDENTS IDENTIFIED FOR THE BILINGUAL PROGRAM? During the registration process, all families complete a Home Language Survey. If another language is spoken in the home, we are required by the State to screen students for the bilingual program. Students are recommended to receive English language support based on the results from the State required English language screener test. The test measures the student’s ability to listen, speak, read, and write in the English language. 4. WHAT IS THE BILINGUAL PROGRAM? District 89 offers English language support through various program models for students who are learning English as their second language and need assistance in developing the academic language skills required for academic success in school. All students enrolled in this program learn English while studying school subjects. These subjects include language arts, math, science, and social science. The Bilingual program has four program models to meet the needs of a diverse group of learners. Please look below for the program models we use in District 89. One-Way Dual Language – Spanish speakers (one language group) learning in English and Spanish K – 5th. Two-Way Dual Language – English and Spanish speakers (two language groups) learning in English and Spanish K – 5th. Sheltered-English – Classrooms with all English learners receiving core instruction with a teacher that has an ESL/Bilingual endorsement. Resources, curriculum, and assessments are the same as in general education classrooms. ESL Resource – English learners in general education classrooms receiving language support until they meet the state’s exit criteria of 4.8 composite English-proficiency level as measured by ACCESS. The Bilingual Programs in District 89 are based on a dual language model that emphasizes the development of bi-literacy and the goal is language proficiency and academic achievement in English and Spanish. We have started a one-way dual language program at Jane Addams, Lincoln, and Melrose Park Schools for grades K and 1st. We are phasing out the self-contained transitional bilingual program at Melrose Park and Lincoln and will add another grade every school year to the one-way dual language. The ESL programs in District 89 provide support in a variety of ways, including resource services, self-contained classes, or co-taught classes. A sheltered instruction approach is used to teach both language and content simultaneously. Students benefit academically by being in bilingual/Dual and ESL program models. Teachers use special teaching techniques to provide instruction. Lessons focus on learning vocabulary and developing reading and writing skills, while developing academic concepts. The teachers are providing students with opportunities to speak, listen, read and write in all subject areas. Teachers use a wide variety of visual aids and hands-on activities to ensure students’ understanding. Every school in the district has a program model that supports the language and academic needs of ELs. 5. HOW LONG DOES IT TAKE TO LEARN ANOTHER LANGUAGE? The most comprehensive work done in this field is the research conducted by Wayne Thomas & Virginia Collier. Thomas & Collier studied the language acquisition of 700,000 English language learners in a longitudinal study from 1982 to 1996. They wanted to find out how long it took students with no background in English to reach native speaker performance (50th percentile) on norm-referenced tests. In addition, they looked at variables such as socioeconomic status, first language, programs used to learn English, and number of years of primary language schooling. In their study, Thomas & Collier found that the most significant variable in how long it takes to learn English is the amount of formal schooling students have received in their first language. They found that it typically takes between 5-9 years to learn another language academically (Thomas & Collier, 1997). It takes 5 years or less for students with a strong foundation in their native language and up to 9 years or more for students who were weak in their native language. Our Bilingual/Dual program in District 89, which now uses a dual language approach, has a content allocation plan to help grade level dual language teachers know when to teach English and Spanish. Students in the ESL program receive support in their English development and that support is gradually released as the child acquires English and attains higher levels of English proficiency. 6. HOW DO WE KNOW THAT ELL STUDENTS ARE MAKING PROGRESS? All English language learners in K-12 must be assessed annually for English proficiency growth and academic progress. The ACCESS test is used to assess English language proficiency while the PARCC test is used to assess academic achievement in English. As a district we use a variety of academic measures to monitor progress of all learners. In order to make sure students are on track with their learning, we use district-wide assessments to measure growth. The EL Resource teachers and General Education teachers work collaboratively to make sure students are making their growth targets for the year. Bilingual and Dual Language classroom teachers administer assessments in English and Spanish, therefore they make sure students are making their growth targets in both languages.